Ahhhhhh. 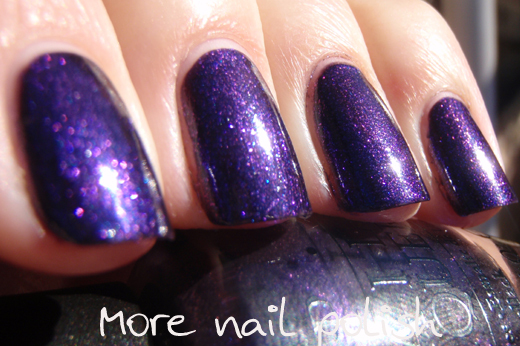 Who doesn't love a bit of gorgeous purple shimmer? 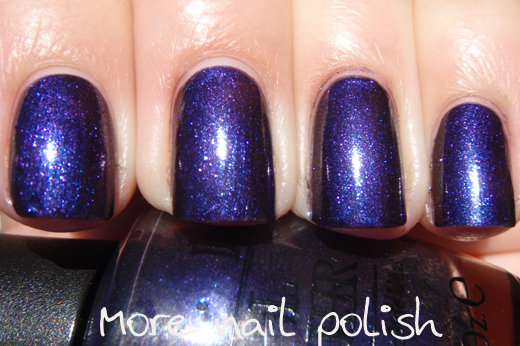 Today's combo is the very pretty OPI Ink, which looks a murky dark blurple in the bottle, but on the nail it has a stunning purple shimmer. Looking at swatches online it seems to be a lot more blue in most photos, but it's definitely more purple in real life. 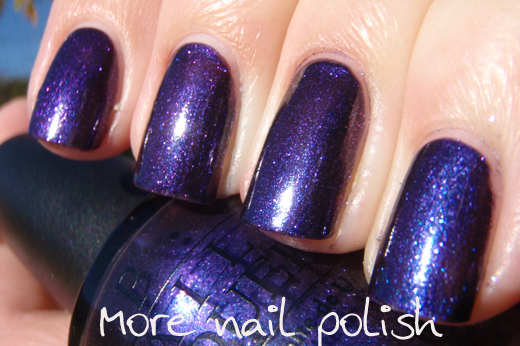 This polish was released as part of the OPI Night Brights collection in 2007, the very same collection that had the original My Private Jet in it. I don't know if this is in fact hard to find these days, but thanks to the lovely Alanna from Pretty Purple Polish that picked this up in Sydney for me. Anyway, this is Chemistry 205, which has a lightly tinted purple base, fine silver glitter that spreads out perfectly, and silver holographic bar glitter, which doesn't curl and lays perfectly smooth on the nail. 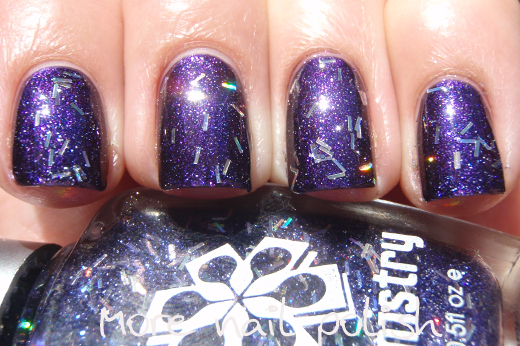 Thanks go to Kristy from The Polish Haven for sending this awesome polish my way! Two coats of OPI Ink, one coat of Chemistry 205, one coat of Seche Vite top coat. I'm totally in love with this combo. How about you? Yay or Nay on the bar glitter? I'm Nay for bar glitter. I just can't seem to like it. But I LOVE OPI Ink. Man that's a great polish! Ooh such a pretty glitter! though, Yay for OPI Ink! Great combo! I love the bar glitter! Ooh, I think I have Zoya Mimi. I can do a quick comparison for you. I adore bar glitter, especially when it has small glitter mixed in cause it looks like streamers and confetti! Party on my nails? Heck yes! !